and deodorants), liquid-solid mixtures and other items of similar consistency. Passengers may carry small quantities of the above-listed liquids in their hand luggage. These liquids must be in individual containers with capacity no greater than 100 ml, and all containers must be packed in one transparent one-litre re-sealable plastic bag. For easier screening by security personnel, these containers must fit easily in the re-sealable plastic bag. The bag of liquids must be taken out of other hand baggage to be screened separately. Baby food for use during the trip Medicine (liquid, gel or aerosol), insulin and liquid dietary requirements for use during the trip. You may be required to prove the authenticity of these liquids at security checkpoints. Items purchased by passengers either in an EU airport shop when located beyond the security point or on board an aircraft operated by an EU airline. VERY IMPORTANT: For return trips in a single day to EU airports and for connecting flights at EU airports, these articles must be kept in special sealed bags until the final destination, along with the sales receipt. Otherwise, the contents may be confiscated at checkpoints. Note: these rules do not apply to checked baggage. Articles that are not duly sealed may be confiscated by the authorities at security checkpoints.These rules do not apply to checked baggage. 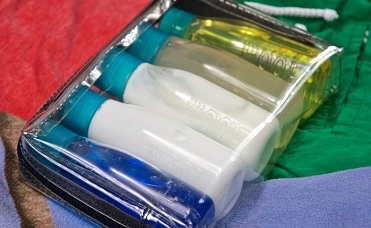 Passengers may pack liquids, creams and other similar articles in their checked baggage. Passengers must remove their coats and/or jackets before walking through the metal detector, for separate screening. Laptops and other large electrical devices must be removed from hand luggage for separate screening. The Regulation applies to all passengers departing from or with connecting flights at any European Union* airport, as well as airports in Switzerland, Iceland and Norway.